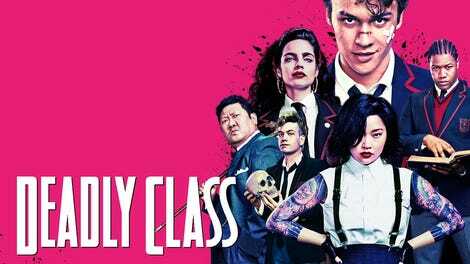 Syfy’s Deadly Class had a rocky first season but ends in style, recalling everything from Kill Bill to The Texas Chainsaw Massacre to The King of Comedy. When the bodies are counted, Fuckface is dead, Lex has been shot, and Gao has kidnapped her niece to induct her into the family business. It’s a great finale in that it resolves just enough of the action of season one while also ending in a way to keep us hopeful we get a season two. The program hasn’t been renewed yet, but it seems very likely to be so soon given it ranks fifth on Syfy (above shows that have been renewed like Wynonna Earp) and has a loyal, vocal fanbase. We need more time with the kids of Kings Dominion! Most of “Sink With California”—the name is taken from a 1983 punk song by the band Youth Brigade—is very action-heavy, as one would expect from a season finale for a show about young assassins. There’s a ton of fighting, shooting, and blowing things up, elements that don’t really translate well to recapping. Overall, it’s well-shot and feels like it has real stakes with character work embedded into the action. Meanwhile, Marcus is making a weapon. The entire team of KD Scoobs is prepping for an assault on Fuckface’s redneck compound. There’s no movement inside, which leads them to believe they’re getting drawn into a trap. Of course, they go anyway. The plan is to blow up the front door with fireworks as their cover. It appears that there’s no one there but the goats, chickens, and snuff videos. It’s weird and creepy. Before “Dueling Banjos” can play, Lex is caught in a trap and chaos bursts out. There’s total carnage to the dulcet tones of Willie Nelson, which is not something I realized I needed before now. Fuckface comes out shooting and Saya is overcome by one of his minions, leading to one of the season’s key moments: Maria has a chance to save Saya…and she doesn’t take it. Is Maria crazy enough to let Saya die so she can have Marcus? It appears so. Outside, Billy and Petra are about to kiss when Part 2 of the assault plan doesn’t work. The back door doesn’t blow up like they planned and Fuckface appears to have Marcus trapped. They don’t and one of Fuckface’s minions literally explodes into pieces, knocking Saya’s attacker off of her. She’s quickly dispatched with and the episode’s centerpiece begins, a vicious, well-choreographed fight between Saya and Maya. Slashing, jumping, diving—it’s a fun scene, amplified by the intensity of the performers and what we know about their characters. While Lin is still on the run and looking to save his daughter, there’s a lot of one KD kid saving another KD kid across town. Billy saves Saya from a bald, overall-wearing monster. Lex gets saved from near-death. They’re a team! Well, at least until Saya claims she’s done and marches off. It turns out that Marcus is in the basement on a makeshift stage for a talk show hosted by Fuckface himself. There’s some discussion of pain and how the country idolizes mass murderers and not saints. Marcus uses his gift of gab to convince Fuckface that he just needs some guidance. He can’t fix his pain by causing more pain. He even gets Fuckface to admit that he really just wants to come to school with Marcus. That ain’t gonna happen. It was a trap for Fuckface to let his guard down and the two fight, tumbling into another room. It’s there that Marcus unlatches a gate on one of Fuckface’s dogs, and watches as the canine literally rips out the throat of Marcus’ nemesis. Moral of the story: Be kind to animals. Lin’s arc ends not with a murder from Diablo’s men but with Gao catching up to her brother and niece. She takes him to the temple as the KD kids stumble out of Fuckface’s compound. Maria and Marcus take the chance to fight and sorta break up. He calls her an obligation and she says she’s broken. They march out to find Diablo in the street, who notices that Marcus is holding Chico’s head. “I was hoping to ask you if you had found my son,” he says. “I see that you have.” And then Diablo’s man shoots Lex. Cut to black. Rick Remender, the creator of the comic, got screenplay credit on this episode, and it’s got one of the best scripts of the season. Lean, mean, and impactful. For the record, Adam Kane directed. He did four episodes this season and has worked on a number of visually striking shows, including Hannibal and American Gods. I’ve taken to calling the Kings Dominion kids the Scoobs a la Buffy the Vampire Slayer but doesn’t it feel more like Joss Whedon’s hit with every episode? Again, it’s a team, some with more power than others, romantic entanglements, and a hero with great responsibility. Marcus is Buffy, Maria is Angel, Saya is Spike, Billy is Xander, Petra is Willow, Lex is Cordelia, Lin is Giles? It’s not perfect but it’s close. I’ll work on it. A season with great music cues ends with some awesome ones: “London Dungeon” by The Misfits in the opening scene; “Whiskey River” by Willie Nelson during the fight; “Mister Crowley” by Ozzy Osbourne during the Lin fight (which may be my favorite needle drop of the season); “Asleep” by The Smiths in the closing scenes. Anyone surprised we didn’t get a Willie return other than the use of Mr. Nelson? Could he be gone forever? Somehow I doubt it. Who’s your season one MVP? It’s a tough call. Benjamin Wadsworth has been a solid, more-than-capable lead, and Lana Condor is very good, but I’ll go with María Gabriela de Faría, who took a part that could have been a two-dimensional, “unstable love interest” role and added depth to it that wasn’t even on the comic book page. Brian is the Editor of RogerEbert.com, President of the Chicago Film Critics Association, and a contributor to Vulture, Rolling Stone, and The New York Times.